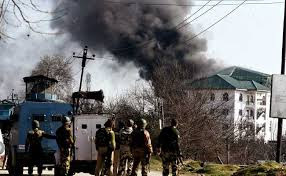 Top US daily “Washington Post” reports, against the backdrop of “suspected militants” taking refuge in government building off Pampore, the saffron rich town in the outskirts of Srinagar, that the latest round of the unrest in the Kashmir valley has prompted India go in for its “biggest crackdown” in decades in the state. Refusing to take sides, the report says, while “India accuses Pakistan of arming and training rebels to cross the heavily militarized border that divides the region between the two countries”, as for Pakistan, “it denies the allegation and says it offers the rebels only moral support.” However, it adds, “most people” in the Kashmir Valley are in “favour independence or a merger with Pakistan. Activists have long campaigned against India’s armed forces special powers act, which gives troops sweeping powers to interrogate or shoot suspects on sight. Also, under the draconian act, federal army and paramilitary soldiers cannot be prosecuted in civilian courts unless federal approval is granted.